Was Thanksgiving dinner different during Victorian times? If you were to sit down at a Thanksgiving table in 1883, you would see the familiar turkey and cranberry sauce and pies. But, what might surprise you would be, first, macaroni and cheese, and next, the meal that arrived when the Victorians called for macaroni and cheese. In 1883, macaroni was said to be an acquired taste, and was still unfamiliar to many. To make macaroni and cheese, housekeepers were advised to boil the macaroni, then mix in a tablespoon of canned tomatoes, and then add a layer of freshly grated cheese. On top of this, successive layers of boiled macaroni, canned tomatoes, and grated cheese, were added until the serving dish was filled. When the resulting meal was delivered to the Thanksgiving table, it might be more familiar to us as a sort of lasagna instead of the macaroni and cheese we know. Not surprisingly, if you were to venture into the kitchen, the meals most familiar to us would be somewhat unfamiliar in their preparations. Soon after arriving home with the Thanksgiving turkey, housekeepers were advised to dress the turkey, and then bathe it several times in a mixture of salt and water. After washing it a few times, and after preparing a brisk, healthy fire, the turkey was roasted. Two hours was the suggested roasting time for a ten-pound turkey. The dressing was made of bread crumbs, butter, salt, pepper, thyme, sage, sweet marjoram, and one egg. It was kept moist by adding in some hot milk. Many liked chopped onion or sausage to be added. As the turkey roasted, it was basted with butter,water, and later, pan drippings. Before bringing the turkey to the table, many added fried oysters to the plate. Before the advent of canned cranberries, the preparation of this Thanksgiving tradition was a source of anxiety for many. One writer claimed that there was no fruit that was “more widely abused.” To prepare a quart of cranberries, housekeepers were advised to have a pint of cold water and a quart of sugar at hand. After washing the berries, housekeepers were advised to add them and the pint of cold water to a granite saucepan, and begin cooking them slowly. Hard boiling would ruin them. As the berries cooked, the sugar was to be added in slowly. As the berries, water, and sugar melted into a syrup, more sugar was added. The mixture was never to be stirred and took about 45 minutes to prepare. As they are today, pies were a Thanksgiving Day staple too. Two varieties, mince and pumpkin, were the most popular. Most advice of the time assumed that just about everyone knew how to make a good pie crust and that any country woman worth her salt could make a top-rate mince or pumpkin pie. In the country, mince meat would need to be made long before the Thanksgiving Day holiday. In the city, it could always be purchased, whenever needed, at the grocery store. To make a pumpkin pie, a housekeeper needed a pint of stewed pumpkin, strained through a sieve. To this, four eggs would be added, along with a quart of milk and some spices and sugar. After baking, the pie was sprinkled with powdered sugar and brought to the table. Other familiar sights filled out the Thanksgiving table of 1883. Mashed white potatoes, roasted sweet potatoes, celery, pickles, and bread were all there. So were sweet cider, raisins, nuts, and black coffee. Cole slaw was another popular component of the Thanksgiving Day meal. Like parents today, Americans living in Victorian-era Massachusetts, worried about how to entertain the little ones. One Boston Globe writer advised involving the children in making their very own Thanksgiving Day creation. The writer advised providing the children with a large moulding board and a tin pan, far away from the kitchen. With the pan on the moulding board, the children were to add 12 tablespoons of white flour, some water and a handful of raisins. After this, they added four tablespoons of sugar , some molasses, vanilla flavoring, cinnamon, and allspice. One egg later, the concoction was ready to cooked on the stove for two to three hours. The writer advised saving the eggshells for ornamentation. The smell of burnt pastry was the sign that the children’s creation was done. It wasn’t edible, of course, but children could then be escorted outside to the woodshed, where a helpful adult would dismantle their concoction with a sledgehammer or axe. 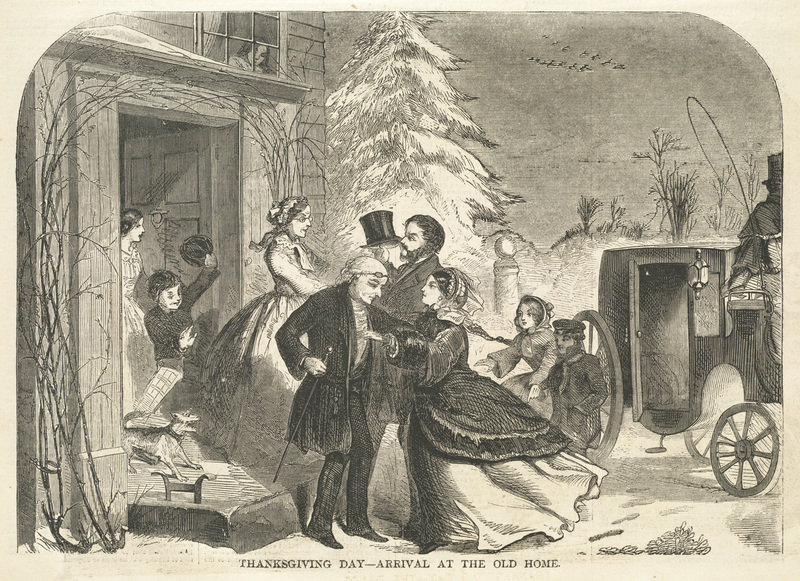 One look at Thanksgiving Day advice for 1883 shows that the Thanksgiving meal hasn’t changed much in the last 130 years, even if the preparation of the meal, and diversions for those not involved in the preparations, have. Sure, Thanksgiving dishes of macaroni and cheese and cole slaw might seem strange to us today, but the turkey and cranberry sauce were still the mainstays of the Thanksgiving meal even then. And, hasn’t the Thanksgiving meal always been about the turkey and cranberry sauce? Macaroni and cheese on the Thanksgiving table persists as an African-American tradition, I am given to understand. 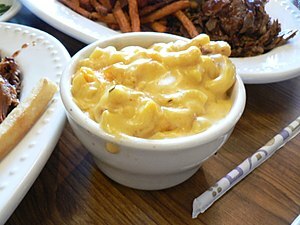 What you describe as 1883 “macaroni & cheese” would be called baked ziti or plain baked macaroni today. Lasagna is made with lasagna noodles, ricotta, grated cheese, either or both meatballs & sausage & tomato sauce (gravy). Lasagna survives in traditonal Italian homes for Thanksgiving as does raviol. Interesting! Thanks Anne for this clarification. I had an idea that this 1883 macaroni might survive today, but wasn’t sure how to find out more, and what it might now be known as.